Something is rotten about these potatoes. The following information is for those signed up for the course at EDx.org: CS169.1x. The subdirectory “rottenpotatoes” and the files for the program were just plain missing from the VM – vdi files supplied and downloaded. The instructions for downloading and setting up Virtualbox and the VM image are found at the beta.saasbook.info web site. Text and a video screencast are there and are pretty clear. Except the files needed to run the program were missing. I set up Ubuntu Linux as described which worked just fine, accessed my network, surfed the web using Firefox and all looked well. 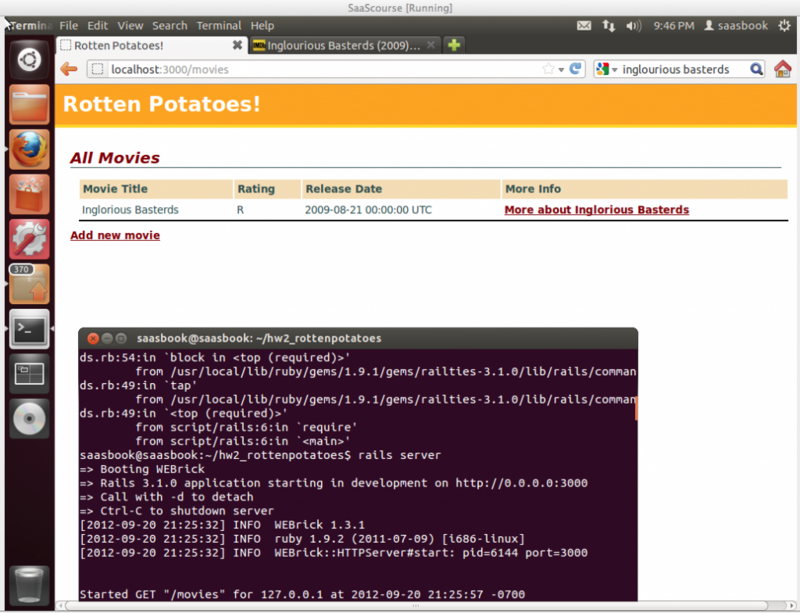 But, there was no subdirectory containing the test assignment program “Rotten Potatoes” – a takeoff on Rotten Tomatoes, the movie review site. The gist of this was found thanks to eekbix.wordpress.com. My version is shorter, but was all I needed to do. Hopefully this may save a few others some hours of tinkering and wondering. Rotten Potatoes – Working like a charm.